It is always said that with Rekha time always ran on slo-mo. Even now, she makes time run slow for her at the confines of her ‘fort’ when the rest of us are chasing some unattainable goal. Bollywood legend has it that the diva ages in ‘slow-time’ because she lives in slow time – it’s a way of life that Rekha has chosen for herself, say friends. It is also the reason why her contemporary actors seem like they have not been spared the onslaught of time while Rekha still manages to look half her age. Whatever the stories, Rekha’s mystique has managed to stay out of the purview of the intrusive media for the longest time possible now. It is said that Rekha discovered by accident that the more she stays away from the media, the more she will seem mysterious and unattainable. That eventually became her personality over a period of time during the later years. But make no mistake, Rekha is perfectly aware of what is happening around her and is always accessible to the people she loves. Another queer thing about her is that she never really receives any phone call; a call to her is always intercepted by an answering machine and if she wishes, she will call back (which is rare). She does have a mobile, but as she says it is nothing but a “missed call machine” to her than a tool to communicate. Should a message left on her answering machine interests her, then the caller will receive a call back from Rekha’s maid, who speaks in a 12-year-old child’s voice. She will probe you with some more questions before handing over the phone to her ‘Madame’. Her friends say that both the ‘Madame’ and the ‘maid’ are actually Rekha speaking in two voices. 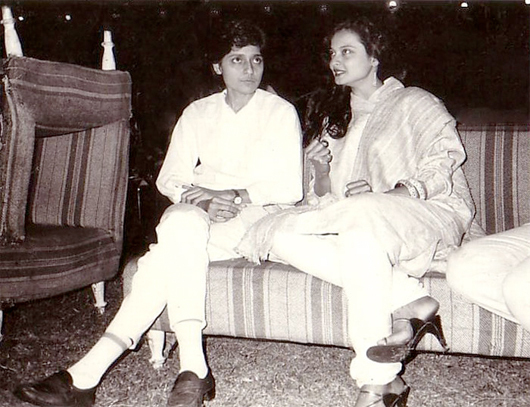 Here’s a glimpse of the good old days when Rekha used to be really vivacious and bubbly. These are footages of her performing for a show in Lahore, Pakistan. Those days, actors and actresses used to sing on stage too. Note how a husky-voiced Rekha was a sport and sang alongside Vinod Khanna (whose voice was no better by the way). Writing on Rekha is very difficult because no other celebrity has been so maligned and abused as she has been in her lifetime. Hers is a life that has been well-documented right from her birth. Let’s take a few examples that have been endorsed by the reclusive actress herself; some that have been debated and denied. In her words, she was a love child of legendary South actor Gemini Ganesan and actress Pushpavalli, but was never acknowledged as his child by her actor-father. That craving of a child for her father’s attention was to always haunt her, and perhaps, also the reason why she would often refer to it in her interviews when she made it big in Bollywood. Behind the cultivated and sophisticated persona of Rekha today is a girl who’s seen the worst of film industry, right from the time she stepped into the industry as a 13-year-old. The actress, who’s considered to be Bollywood’s ultimate seductress, was once considered ‘dark’ and ‘ugly’ compared to her elder sister. But the ugly duckling blossomed one day and how! Here is another slide-show just to tell you how she used to look when she started off and blossomed as an actress, she is one actress whose looks have drastically changed over time. Here is a slide-show of some rare newspaper and magazine ads that featured her. These are things that Rekha admitted on record. But there are some things that she kept on denying for the rest of her life. Like the alleged affair with Amitabh Bachchan, a sort of an open secret that was lapped up by every magazine of yore. But Rekha still maintains a distance from admitting to the relationship. In fact, in the most candid interview that she has given till date to Simi Garewal, she spoke of her relationship in such a way that she actually didn’t seem to have said anything at all. A prime-time exercise in futility! Please note the unbelievable word-play in the interview: One moment, she declares that she has so much love for ‘Him’ that it cannot be compared with any kind of love. Scroll back, and you’ll see that just before that statement, she has denied being in love with ‘Him’. Then she says, she was in love with Amitabh Bachchan, the larger-than-life personality, and not the man himself. While the episode seemed to have turned to become one ‘big lie’ by the diva, she ended up saying the truth in other ways. It also gives an interesting peek into her mind. Some other topics that Rekha never spoke about included the suicide of her husband Mukesh Aggarwal. Or the physical and mental abuse she endured in her life from the men she loved so intensely. But all these topics were touched upon by author Mohan Deep in his book Eurekha. As soon as the book hit the stands, Rekha strongly opposed to whatever was written in the book. She even visited book-stores personally asking them not to stock the book. But what was surprising was that she never really challenged the authenticity of the book on a public forum or otherwise. So, while the contents of the book can be debated upon, most of the incidents mentioned in the book did take place in her life and have been engraved on the pages of old film magazines. So, here is a woman who has seen much grief in her life, a woman who never married, never had a long-term relationship with a man and has now locked herself up in her house, coming out sparingly on occasions. Documenting the daily life of this recluse was really tough, especially as she is also very savvy on the internet. Yes, that’s one of her traits now. So, chances are that along with you, she is also reading this article. But before we go on to the next chapter where I try to present her daily life as told to me by her friends, here is a slide-show of the some of the later pictures of the diva. 1) No one, but one has access to her bedroom: Rekha has basically barred the whole world from entering her house. Even the few who do are limited to being entertained in her living room. The only person who has access to all parts of her house is her secretary Farzana, who’s been a constant companion for more than three decades now. 2) Most of her staff have been asked to leave: Most of the household staff, including Rekha’s cook has been asked to leave. She apparently has started cooking for herself. In fact, she has started doing most of the things herself, unlike other Bollywood star. For the record, Rekha is a strict vegetarian. Interestingly, this news made it to the pages of the tabloids. 3) Rekha spends most of her time tending to her pets: Rekha always had little dogs as pets that she loved so dearly. Who can forget her dog Pisti? It was as famous as its mistress. She spends hours grooming her pets, which these days also includes a cat. 4) Her ‘me’ time: Rekha spends at least five hours a day attending to herself. It can be yoga, exercising or indulging in some home-made beauty therapy. 5) Tending to her plants: She spends at least two hours working in the small kitchen garden that she has prepared. 6) Meditation or is it Tai Chi? Rekha practices some kind of meditation. Some say it is Tai Chi, while others say that she is into holistic healing practices. Whatever it is, nobody is sure about this one. 7) Writing an autobiography: Her friends say that the news of Rekha writing her autobiography is true. She has been writing the book for several years now and is constantly editing her drafts. There are definitely some things that she doesn’t want to talk about. We hear that she’s dictating the book to Farzana. 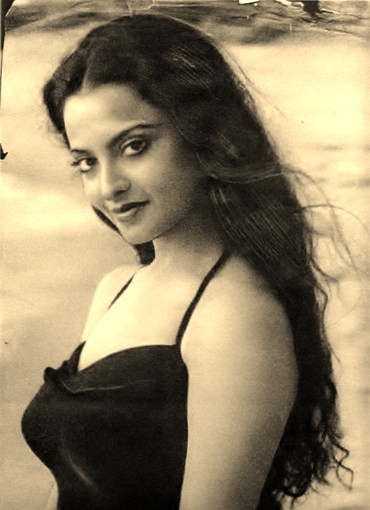 8) Listening to music: Rekha spends her evenings listening to some music, surfing the net and sometimes watching TV. But that’s not an everyday affair. She loves Indian classical songs. 9) Brooding all alone: That is something that most friends actually admit. Rekha can sit by the window and stare at the Sun for hours altogether. 10) Last but not the least: There is still one mysterious visitor, who still checks on Rekha every week and spends time talking to her. If Rekha is reading this article then I expect her to tell us the name of the person sometime in her lifetime. That will be the last big news about her, we think. Even if you barge inside Rekha’s room, you will never catch her reading – be it books or newspapers. She has never read a book in her life! Yes, really! Is that a secret to her ageless beauty? May be! Before we leave, we would ask you to go back to the video clip of the Simi Garewal interview where she is at her candid best. Here, you will see an adorable video of Rekha with her pet too, just scroll to 10.22 seconds and you will see the rare video of her very first pups that she owned. This is also the same video where she talks about her late husband Mukesh Aggarwal. She actually met him only once before marrying him and a year later, the same man committed suicide and left a suicide note saying that he “doesn’t blame anybody”. Shocking revelations but true. People looking for even more gory details about Rekha’s husband’s death, here is an account by veteran journalist Nishi Prem. Here you will see how painfully Mukesh killed himself. I am pasting scanned copies of the article, spread over six pages (I got only three). However, there’s no verification about the authenticity of the article. 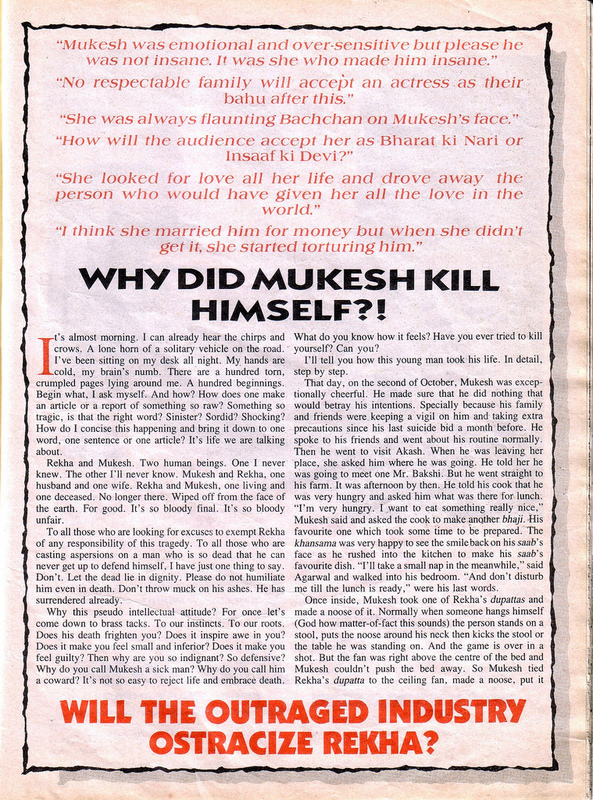 But nothing could be more shocking than this article which basically says everything what her peers thought about her when Mukesh Aggarwal killed himself. Well, Rekha didn’t have an easy life and she says that it was never easy to be Rekha. See this old video interview I have managed to locate where she says this. This is actually the first part of the same interview that I have posted before. She was doing well untill this oversensitive guy came in her life and killed himself. She had to bear the brunt of his actions. How do things change now that Rekha is a Rajya Sabha MP. Can she afford a bad attendance in the house ? Fascinating post. She is the tragic heroine of Hindi cinema I think. You could make a movie about her life. She is also one of the most fortunate actresses to have done some of the amazing roles in her times – which other heroines coming after her never got. I think only Vidya could be considered in Rekha’s league now. In fact, you would not need to act again after having been given such a wonderful role like Umrao Jaan. That movie was really poetry on screen. Sadly, her contribution to Hindi cinema has been overshadowed by her lovelife. But she is indeed a living legend. Thank-you Rekha, for the movies! I have a feeling Miss Malini just ripped off this post and used it on their blog in an article they posted on Rekha 2day – if they did you deserve to be credited. Just thought you should know about this. Its tough to go through what she has gone through. She cannot be blamed for Mukesh’s suicide, if something doesnt work, you walk out of it, NO need to commite suicide. Whatever be the inside story, she has fought the odds, become the odd ‘wo’man out and is still in the business. That’s brains, grace and above genuiniety. Long live Rekha.